Comprising of so many muscles, bones, joint and ligaments the foot is as individual as a finger print. Different shapes, sizes and patterns of movement ensure no standard off-the -shelf shoe can be designed to correctly fit all requirements. For athletes custom fit training shoes can make the difference in avoiding long term injury due to stress and strain on ligaments and muscles and enhance the comfort and efficiency of every step. Imagine then going into your local sports shop and purchasing training shows customized for your feet. The team at New Balance Athletic Shoe Inc. may be bringing that day closer than you think. Using 3D-Printing technology the Brighton-based company have supplied their sponsored athletes with customised running shoes. 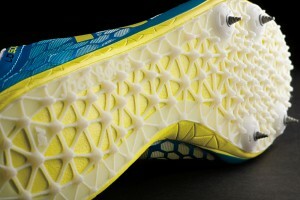 In January Jack Bolas ( a member of the Team New Balance) became the first athlete to compete in the customised shoes. Bolas went on to finish fourth out of the ten competing runners. Bolas was taken to the Brandeis University in Waltham, where he was fitted shoes wired with a hundred sensors each tracking and measuring pressure as he ran the campus track. Motion capture cameras were also placed around the track. In addition to Bolas 2012 Olympians Barbara Parker (Britain) and Kim Conley (US) along with 1500 meter World Champion gold medalist Jenny Barringer Simpson are also involved in helping New Balance develop their highly customizable footwear. The goal is to extend the service to non-professional athletes competing in spikes with the eventual goal to revolutionize future footwear manufacturing. While on holiday last month I ventured into the Krakow Museum of Modern Art only to discover (much to the joy of my inner geek) a Solar Sinter machine designed and developed by Markus Kayser. Selective Laser Sintering is the process of creating a very precise 3D object from a variety of powdered plastics, resins and metals using high tech lasers to trace out shape based on computer drawn 3D designs. 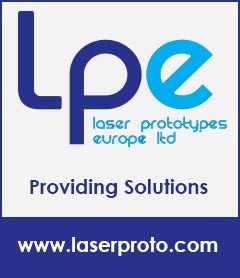 Laser sintering has within recent years become a key tool in 3D printing or design prototyping. The Solar Sinter machine takes this Selective Laser Sintering process and adds and Eco twist. Deserts occupy some 20% of the earths land surface with two elements dominating, sand and sun. Visiting the Egyptian desert in August 2010 as part of his Sun cutter project led Kayser to realise the potential of a new machine that could bring together these the vast energy source of the sun and the almost unlimited supply of silica in the form of quartz. Using a sun tracking device the entire Sinter Machine rotates about its base throughout the day to ensure a large Fresnel lens (1.4m x 1m ) faces the sun at all times. Taking direction of computer drawn model of the object the machine moves the sand box along the X, Y and Z coordinates at a carefully calculated speed, whilst the print head lens focuses a concentrated beam of light reaching temperatures of up to 1600ºC which melts the sand. 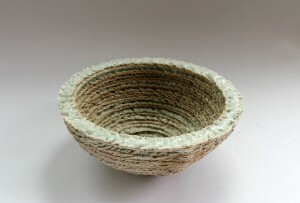 Layer by Layer the object is built and once completed and cooled the object is simply dug out of the sand box. Objects printed using the solar sinter consist of a rough sandy reverse side whilst the top surface is hard glass. As composition of the sand varies between regions different results can be produced in different deserts and by mixing sand different combinations of colour and material can be achieved. With even the battery used to move the solar sinter machine powered by the sun, could this new 3D printer hold the key to developing a more sustainable form of manufacturing in some of the the worlds poorest regions.